Yellow is bound to brighten up the day. It increases concentration and grabs attention. These yellow binding combs come in a range of sizes from 3/16 of an inch to 2 inches; these binding combs can fit any sized project up to 425 pages. The 19 ring design of these combs fits 8.5 x 11 inch paper and any standard comb binding machine. They are designed to lay flat in both an open and closed position, which makes reading easy and allows for getting correct margins for photocopying. Welcome to MyBinding video. Let's face it, not every job sees the sun but here at MyBinding, we think we found the solution. 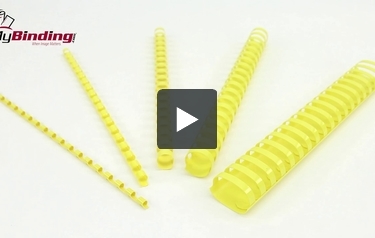 We think that these yellow plastic binding combs are almost guaranteed to brighten up any of your days. Ranging from 3/16" to 2", there's a comb for any size project. This 19-hole punch pattern is compatible to fit any standard comb binding machine. Better yet, these yellow combs work with 8 1/2 x 11 paper, giving us reason to rejoice. Proper use allows for pages to flip easy and lay flat, making reading a breeze and allows for getting the right margins for photocopying and depending on your choice of size; you can fit from 1 sheet to 425 sheets of paper. Even better, they won't scratch, chip, peel or discolor. At MyBinding.com, yellow plastic binding combs make any day a good day. For more demos, reviews and how-to's, go to MyBinding.com.